The silver center cent is an American pattern coin, one of the precursors to the large cent and an early example of a bimetallic coin. Less than a dozen specimens are known to exist today, and they generally fetch substantial prices; an uncirculated silver center cent sold at auction for $414,000 in January 2002. That price was eclipsed by an example graded PCGS MS61 offered at auction in April 2012, with a price tag of more than $1 million. The silver center cent was an early attempt to reduce the size of the cent while maintaining its intrinsic value. During the early years of the American republic, there was a general consensus that the intrinsic bullion value of the new nation's coinage should be approximately equal to its face value. Some merchants would refuse to accept coins that did not meet this standard. For most denominations, bullion parity was achieved by producing the coins in a gold or silver alloy. However, the Coinage Act of 1792 specified that the cent was to consist of 11 pennyweight (264 grains or 17.1 g) of pure copper. Such a weight, needed to maintain intrinsic value, would have been too heavy for practical everyday use. 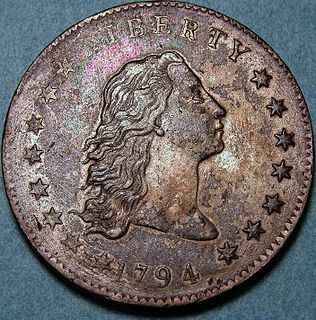 U.S. Secretary of State Thomas Jefferson suggested an alternative: a coin made of an alloy that was primarily copper, but that included enough silver to give a reasonably-sized coin an intrinsic value of one cent. This billon alloy was considered by the U.S. Mint, but U.S. Treasury Secretary Alexander Hamilton feared that it would be too susceptible to counterfeiting, since its appearance differed little from that of pure copper. In 1792, the Mint's chief coiner, Henry Voight, hit upon a solution: a copper planchet, slightly smaller than that of a modern quarter, with a small silver "plug" inserted in a center hole during the striking process. The silver plug would have been worth approximately ​3⁄4¢ at contemporary bullion prices, while the copper planchet added an additional ​1⁄4¢ of intrinsic value. Several such coins were produced as test pieces. Ultimately, the additional labor required for these bimetallic coins proved unsuitable for mass production, and the large cent that was produced for circulation starting in 1793 consisted of 208 grains of 100% copper. The obverse of the silver center cent features a Liberty head with flowing hair. The date appears below the portrait, and the words "LIBERTY PARENT OF SCIENCE & INDUST." are inscribed in a circular pattern around the central devices. The reverse design consists of a wreath with the words "ONE CENT" in the center, and the fraction "1/100" below. Surrounding the wreath, "UNITED STATES OF AMERICA" is inscribed. ^ a b c d e Garrett, J. & Guth, R. (2003). 100 Greatest U.S. Coins. Atlanta, GA: H.E. Harris & Co. p. 48. ISBN 0-7948-1665-7. ^ The J2/P2 pattern has the same design as the silver center cent, but consists of a solid planchet with no silver plug. At least one specimen is made of a billon alloy — see here. ^ The silver center cent has a diameter of roughly 23mm, according to CoinFacts.com. The U.S. Mint's specifications page on modern coinage lists the quarter's diameter at 24.26mm. 1943 steel cents are U.S. one-cent coins that were struck in steel due to wartime shortages of copper. The Philadelphia, Denver, and San Francisco mints each produced these 1943 Lincoln cents. The unique composition of the coin has led to various nicknames, such as wartime cent, steel war penny, and steelie. The 1943 steel cent features the same Victor David Brenner design for the Lincoln cent which had been in use since the first in 1909. The dime, in United States usage, is a ten-cent coin, one tenth of a United States dollar, labeled formally as "one dime". The denomination was first authorized by the Coinage Act of 1792. The dime is the smallest in diameter and is the thinnest of all U.S. coins currently minted for circulation, being .705 inch (17.91 mm) in diameter and .053 inch (1.35 mm) in thickness. The obverse of the coin depicts the profile of President Franklin D. Roosevelt and the reverse boasts an olive branch, a torch, and an oak branch, from left to right respectively. As of 2011, the dime coin cost 5.65 cents to produce. 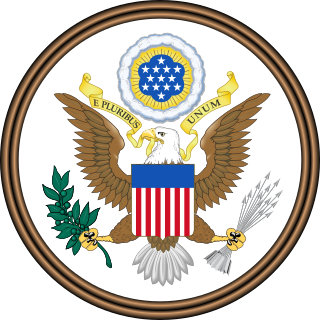 The Coinage Act or the Mint Act, passed by the United States Congress on April 2, 1792, created the United States dollar as the country's standard unit of money, established the United States Mint, and regulated the coinage of the United States. The long title of the legislation is An act establishing a mint, and regulating the Coins of the United States. This act established the silver dollar as the unit of money in the United States, declared it to be lawful tender, and created a decimal system for U.S. currency. 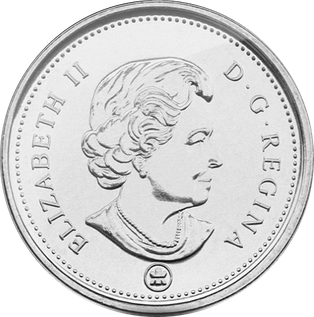 The Canadian five-cent coin, commonly called a nickel, is a coin worth five cents or one-twentieth of a Canadian dollar. It was patterned on the corresponding coin in the neighbouring United States. It became the smallest-valued coin in the currency upon the discontinuation of the penny in 2013. Due to inflation, the purchasing power of the nickel continues to drop and currently the coin represents less than 0.5% of the country's lowest minimum hourly wage. 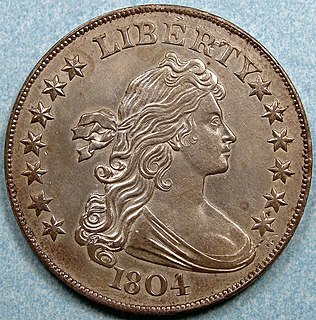 The Flowing Hair dollar was the first dollar coin issued by the United States federal government. The coin was minted in 1794 and 1795; its size and weight were based on the Spanish dollar, which was popular in trade throughout the Americas. The Wreath cent was an American large cent. It was the second design type, following the Chain cent in 1793. It was produced only during that year. The 1792 half disme was an American silver coin with a face value of five cents. Although it is subject to debate as to whether this was intended to be circulating coinage or instead an experimental issue, President George Washington referred to it as "a small beginning" and many of the coins eventually were released into circulation. It is widely considered the first United States coinage struck under authority of the Mint Act of April 1792. The Feuchtwanger Cent was a "German Silver" private token coin circulated by Lewis Feuchtwanger during the 1830-1840s in the U.S. Three cent varieties were also available, though not as plentiful as the one cent tokens. The 1804 dollar or Bowed Liberty Dollar was a dollar coin struck by the Mint of the United States, of which fifteen specimens are currently known to exist. Though dated 1804, none were struck in that year; all were minted in the 1830s or later. They were first created for use in special proof coin sets used as diplomatic gifts during Edmund Roberts' trips to Siam and Muscat.